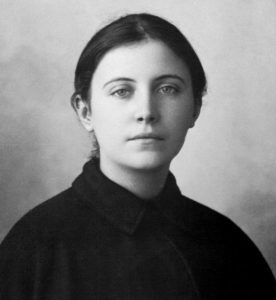 St. Gemma Galgani is a lesser known saint who lived in Northern Italy from 1878 to her death in 1903. When people get to know me, one of the things they find out is that I have a strong devotion to St. Gemma. The next question people often have is why. About six years ago I wrote the following letter to Glenn Dallaire. Glenn also has a strong devotion to St. Gemma. He created and maintains an excellent website dedicated to St. Gemma: www.stgemmagalgani.com. This letter explains my devotion to St. Gemma the best. My devotion started slowly about 15 or so years ago, because of my mother. In 1979 her first grandchild, Molly, was almost two years old. When Molly tried to say “Grandma” it came out “Gemma” -Well… it stuck. Molly and all 19 grandchildren and one great grandchild (Molly’s first) that followed over the next 29 years all called my mom “Gemma.” I know my mom liked it a lot, partially because she was taught by a Sister Gemma when she was a little girl. When I went to graduate school for my MA in Theology at Franciscan University of Steubenville I learned there was a St. Gemma. However, at that time my knowledge of her only went as far as knowing she existed. It wasn’t until 2007 that I began to learn more about St. Gemma, and discovered your website. April 7, 2007 was Holy Saturday. My mom had been suffering from a number of ailments, including heart trouble. She was on several medications. My father suffered from Parkinson’s and dementia. Since neither could take care of the other, we had aides staying overnight at their house. We could not find an aide for Saturday nights, so my mom gave me a little money to stay over on Saturday nights (It was very nice of her, since there is not much money in working for the church). That night my mom went to the Easter Vigil with my dad and sister Mary Jo (I have three sisters and two brothers. I’m the youngest). I met them back at the house when Mass was over, about 10:30 pm. My mom was sitting at the kitchen counter, looking rather spectacular in her Easter best, enjoying some Polish sausage. My sister commented that the Mass was so long. My mom, however, said it didn’t seem long at all and that she really enjoyed it. Not ones to move along very quickly, my parents eventually settled down to bed around 1:00 am. The next morning I woke up about 8:30. My father was awake and the morning aid, who had arrived earlier, was making my dad breakfast. There was a note from my mom in the kitchen asking us to let her sleep in. So, I left for home to watch my daughter, Maria, look for her Easter basket. Around 9:20 my sister Suzy called me. She said that Dad had called and said he could not wake my mom up and that she was going over to check on things. A few more frantic phone calls latter, from my sister and the aide, and I was over at the house. My mother had passed away in her sleep. She was 75 years old. This is when I began to look more closely into St. Gemma. One of the first things I discovered was that she is the patron saint of pharmacists. I thought this was rather funny, considering how my mom subsidized the local pharmacist rather nicely with all the medications she had been taking over the last 15 years of her life. This was quickly trumped when I discovered that St. Gemma died on Holy Saturday. Wow! My mom died Easter morning. It was a really awesome sign. 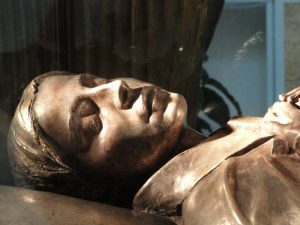 The second day of the wake was on April 11th, St. Gemma’s Feast Day as you well know. I then began to read and learn more about her, but things really started happening on November 10, 2011. My wife and I were leading a pilgrimage to Rome with our friend Brian as our tour guide. On this sunny November day we took a day trip to Lucca to visit St. Gemma. I was excited, but had no idea what to expect. We arrived by train late in the morning and began the walk around the outside wall of Lucca to St. Gemma’s Monastery (see image on left). 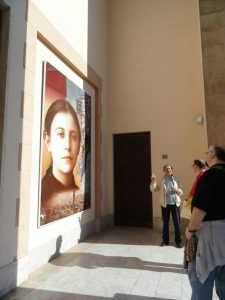 When we arrived we were greeted by a huge picture of St. Gemma on the front of the church. A close up of her looking up in prayer. Once inside we were drawn immediately to her tomb. I knelt down and touched my rosary to the glass that guarded her statue. We could see the stains on her eyes that we later learned were from tears of blood (see image on right). After a few moments I sat in a front pew and began to pray the rosary. I’m not one to have spiritual experiences, but as I prayed and gazed at her tomb, I felt a big lump in my throat and tears in my eyes. If I looked away from her golden image the feelings would subside, only to return if I looked at her again. I had only begun the second decade when an Italian gentleman walked up to me and said something to me in Italian. I indicated that I did not speak Italian and motioned him to Brian, who spoke a little. A minute later the man walked in front of me, from left to right, followed closely by my wife and then Brian. I gave Brian a puzzled look and he threw up his arms to tell me he did not know what was going on either. When the three of them exited the church out the door to my right, I decided I should follow them. When I arrived outside the man was ringing a doorbell to a “St. 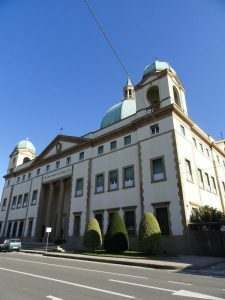 Gemma Museum and Gift Shop.” I was very excited to see this, but when a short Passionist nun answered the door he said something to her in Italian and she went right back inside. A minute later she returned and gave him a key and then shut the door again. I assumed the key was to let us in the shop a little later. Next he directed us to look at another large picture of St. Gemma that hung on the side of the church (see image to the left with the man, Brian and me). This one is the popular front view of her with that piercing stare and her hair back in its usual bun. He had us stare at the picture and walk back and forth in front of it. Her eyes followed you wherever you went. He then took us up the ally on the side of the church, out toward the street, about 200 feet from the picture. Her eyes still followed us. He then began to lead us down the street, around a corner, and down another street toward the town. I said to my wife, Sue, that I didn’t want to leave yet. I wanted to go into the shop. Sue, whose knowledge of Spanish helps her understand bits of Italian, told me that she thinks he wants to take us to Gemma’s house. “So, that’s what the key was for,” I thought. I quickly shut up. As we walked through the beautiful town of Lucca, the man spoke in Italian to Brian and he translated as best he could these amazing stories about St. Gemma that the man was telling him. A walk that should have taken 20 minutes took 45 as we stopped frequently so the man could explain with his hands (Italians… you know). We learned about her guardian angel delivering letters, how she was averse to being hugged or kissed, about her talks with Jesus and her sufferings. At last we arrived at the Galgani’s apartment. We went upstairs and the man showed us the different relics that adorned the rooms of the home turned museum. The second to last room we entered simply had a crucifix and a large closed triptych. He opened the triptych to reveal and marvelous icon of St. Gemma receiving the stigmata from Jesus, with Mary and her guardian angel at her side. He then revealed to us that we were standing on the floor where this miraculous event took place. The three of us fell to our knees in thanksgiving. Brian and Sue wept. As we left the house the man told us that St. Gemma brought him to this house just as he brought us. We were completely amazed. We tried to offer him some money, but he would have none of it. As we walked back from the house the man received a second phone call on his cell phone. Brian later told us that he was explaining to his wife that only one of us spoke Italian and it took longer than he thought. Apparently he was very late for lunch. I believe his name was Giovanni, but I’m not sure. We have no idea why he choose us to take to Gemma’s house, but we are eternally grateful that he did.